So the other goodies I bought was a new Namaste bag. I'm in love with these bags. I now own two, the first I got last year at Chain Link. It's really nice, but I love the one I got this year. It's an eggplant color and alot smaller. It'll do as a project bag or a regular purse....Now I need to get one in olive! I also ordered the CGOA commerative hook. It's a gorgeous hook by Aciano out of California, ascianofiberartstools.com I didn't really look at the hook after I received it at registration. But later I feel in love with her hooks and bought an I. I didn't realize until yesterday that the show hook was by the same artist. Yeah! Now I have two. They are absolutely gorgeous! Can't wait to use them. Next up will be pics of the marketplace. I really didn't get great pics of the fashion show, I was a little away from the stage and it was dark. I also wasn't feeling well during part of the show and missed part of it. I added a few pics of the hooks and needles from Aciano's booth, also K showing off the yarn that she bought in the form of a shawl from The Yarn and Fiber Company. The other lady is Cyndi from The Yarn and Fiber Company showing off another shawl. Cyndi and Jerry are both very friendly and I love just talking to them..
Never posted this, hmmmmm. These were some other purchases at CGOA. I bought the showcased CGOA hook for the year and also bought another hook from that vendor. Love those hooks! The bag is a Namaste, and I think it's going to be a tradition for me to buy a Namaste at CGOA. I love this bag! 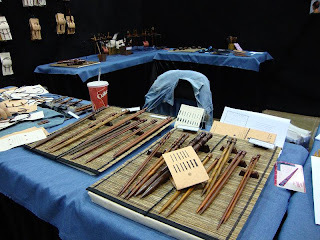 They were there last year and just have some really nice yarns. I think this will make a beautiful Christmas shawl. It came with a pattern, but it's a knit pattern.. The next is Merino Lace Weight from Cherry Tree Hill that I bought at the Yarn and Fiber booth - www.YarnandFiber.com. They are out of Derry, NH and I really need to go visit their store. My friend, K, found the yarn for her SIL to be's wedding shawl here, too. It was a silk lace weight in silver, just gorgeous! My birthday is coming up and I have received some surprises in the mail. Last week, a friend in New Jersey sent me a nice package of supplies I can use in my classroom. Always appreciate that! Very sweet of her...Today I received an envelope from Down Under from another friend on the Sky. SHe sent me some Timtams (yummy Australian cookies) and three luscious skeins of yarn in a gorgeous colorway. I also received a birthday card from a friend across the pond in England. I am making a friendship ghan of 12" green/cream squares and I received a square from a friend in Maine. It has been a good mail week!